Read the manuscript in PNAS . Nerve and muscle signalling is controlled by voltage-gated sodium (Nav) channels which are the targets of local anaesthetics, anti-epileptics and anti-arrythmics. Current medications do not selectively target specific types of Nav found in the body, but compounds that do so have the potential to be breakthrough treatments for chronic pain, epilepsy and other neuronal disorders. Recently some promising lead compounds have been published that can distinguish between the different Nav in different nerve and muscle types, but they take too long to bind to their target to be therapeutically useful. 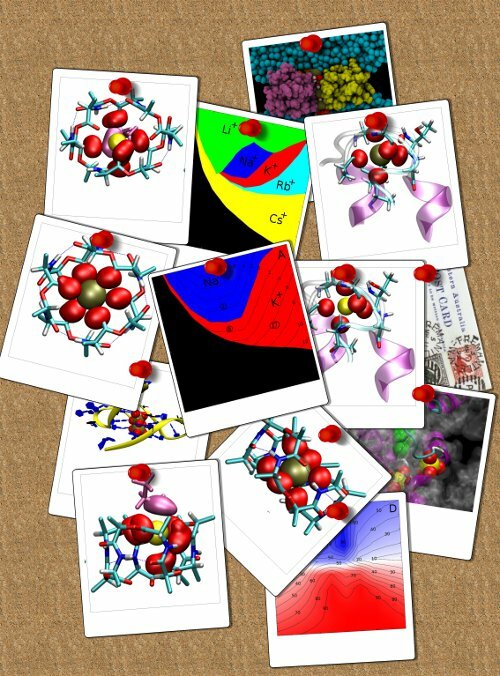 We use long computer simulations totalling more than 26 μs to explain the reason for the slow binding kinetics. Firstly, the negative charge on the compounds is essential for high affinity binding but slows binding as they must pass negative patches on the protein to reach their binding. Secondly, the compounds have to undergo an unfavourable conformational reorientation during the binding process. Addressing these two limitations of could improve the efficacy of this compound and aid future drug development. Read the manuscript in Scientific Reports . What is the potential of carbon nanotube membranes? Nanostructured carbon membranes have often been described as the next big thing in water desalination and filtration. But, what are the real prospects of this technology? 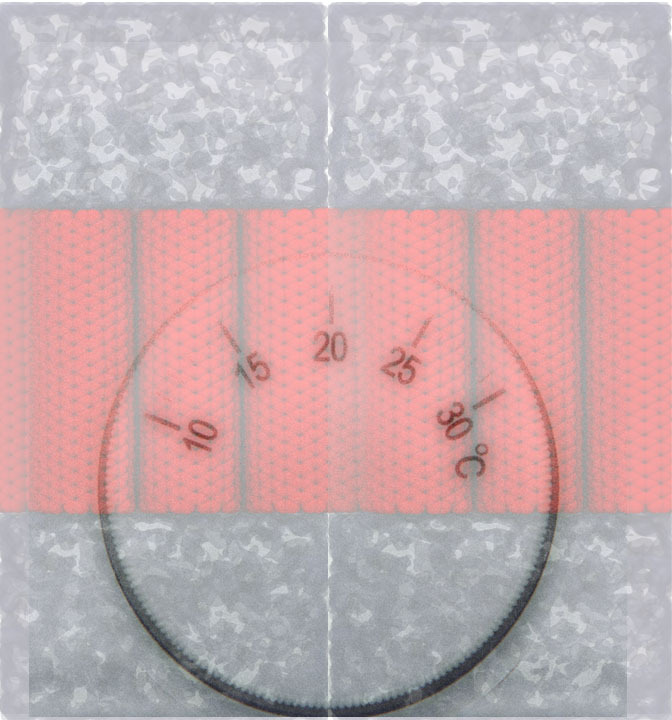 In a recent paper we examine how rapidly water can flow through the nanotubes and how well they can remove salts in realistic operating conditions. We then use this information to assess how they might change the design and energy use of water desalination plants. These materials have unusual properties, however, we find that their impact on water filtration is likely to be very different from what is commonly thought. Read the manuscript here . The inability to adequately sample the conformations of proteins and macromolecules is a common problem faced by molecular dynamics simulations. Because simulations are typically run for less than a micro second, they struggle to directly simulate slow processes or to even sample all the local motions within a long lasting state. A number of approaches, often called advanced sampling methods, have been developed to help overcome this problem, but when faced with an array of potential techniques it is hard to know which is best. To begin addressing this, we compared the ability of a number of methods to sample the relatively simple motions of dye labels on a host protein. Even for this simple system, simulations lasting tens of micro seconds are required to capture the conformations of the labels. The advanced sampling methods we tested all reduce the computational time required, but some perform better than other. To find out which method worked best for us, check out the paper in the Journal of Chemical Theory and Computation. In molecular dynamics simulations an additional thermostating algorithm must be used if you want to simulate at a specific temperature. These algorithms adjust the velocity of the atoms to ensure that the mean system temperature remains close to the desired value. There are many ways of doing this, and some are more appropriate for given situations than others. Recently, we showed that the algorithm choice has a drastic effect on the predicted water flow rates in nanopores. Not only does the rate of flow differ by orders of magnitude when different thermostats are used, but basic physical principles such as whether the flow is frictionless or not can be influenced. In short, choosing how best to maintain the simulation temperature is an often overlooked but important decision. How do anaesthetics find their targets? Local anaesthetic, anti-epileptic and anti-arrhythmic drugs are all known to act by blocking sodium channels and thereby preventing or diminishing the electrical activity of nerve or muscle cells. But how do these compounds find their way into the centre of the sodium channel pore? In some cases this requires that the drugs cross the cell membrane to be able to enter open channels fromt the cytosol, while in others the drugs seem to be able to enter closed channels directly from the membrane. 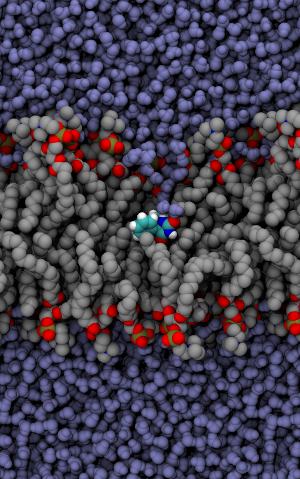 In a recent study using molecular dynamics simulation we have shown how two of these drugs partition into lipid bilayers which can aid their ability to target sodium channel proteins. In another study we have shown that gaps in the protein that extend from the pore to the membrane are large enough to provide a route for neutral drugs to directly block the channel even when they are closed. In our most recent third study we are able to quantify the barriers for drugs to pass through these gaps and to show where they are likely to bind in the channel, highlighting the most important drug-protein interactions. See the papers in PLoS Computational Biology, Biophysical Chemistry and Channels for more details. There is much interest in replicating the exquisite ion selectivity of biological channels in synthetic pores, both for technological applications and as a means of comprehending the physical mechanisms at play in biology. For example, we still don’t fully understand how proteins can distinguish between ions as similar as sodium and potassium. 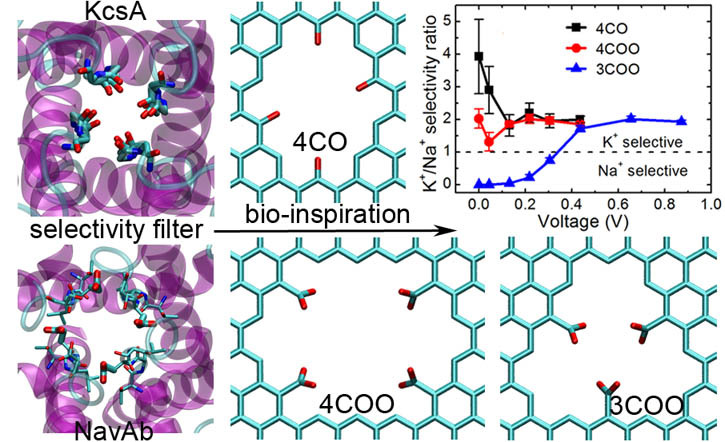 In our recent work we used the structure of two biological pores as inspiration for designing graphene nanopores that are selective for either K+ or Na+. While obtaining K+ selectivity was relatively easy, a number of strict criteria had to be followed to make a Na+ selective pore. Most interestingly, one of our pores displays voltage dependent selectivity: it prefers the passage of Na+ under low electric fields, but favours K+ when the strength of the field is increased. This novel phenomenon may have interesting technological applications as an electric field driven selectivity switch. While these graphene pores are difficult to make, studying such conceptually simple pores allows for the physical basis of selectivity to be explained and can provide an important step in understanding the conditions leading to ion selectivity in a wide range of molecules. 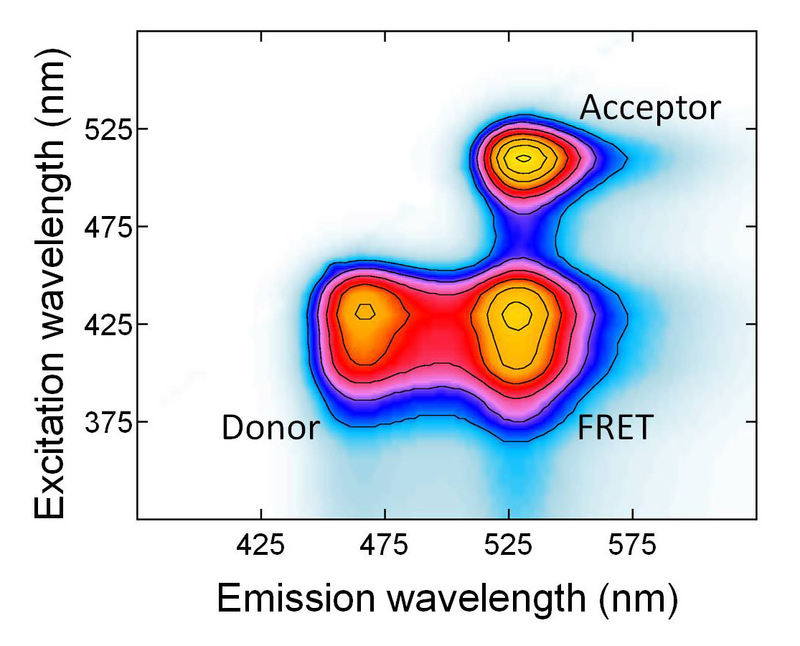 Förster resonance energy transfer (FRET) is becoming widely used to measure the proximity of molecules, to monitor structural changes or to signal biochemical events. However, accurately measuring is difficult due to the overlap of the excitation and emission spectra of the fluorophores that are used in the experiment. Recently we have presented a new robust way to quantify FRET by unmixing the spectra of the light emitted by the sample. The approach is applicable to measurements taken on a microscope using as few as two wavelengths of light to excite the sample, as well as to bulk measurements taken in fluorometers. We hope this will provide a useful tool to researchers in the area. A simple ImageJ plugin, 'FRETTY', for conducting the analysis is available on our software page. Porous materials have many potential uses such as in the storage or sequestration of gases such as hydrogen, methane and carbon dioxide, in aiding catalysis and in developing molecular sensors. All of these applications require the controlled diffusion of ‘guest’ molecules through the pores, but working out how to gain such control is far from trivial. We still don’t have a good understanding of how guets move through the pores, and there are interesting examples of guest diffusion through pores that are smaller than the guest itself. 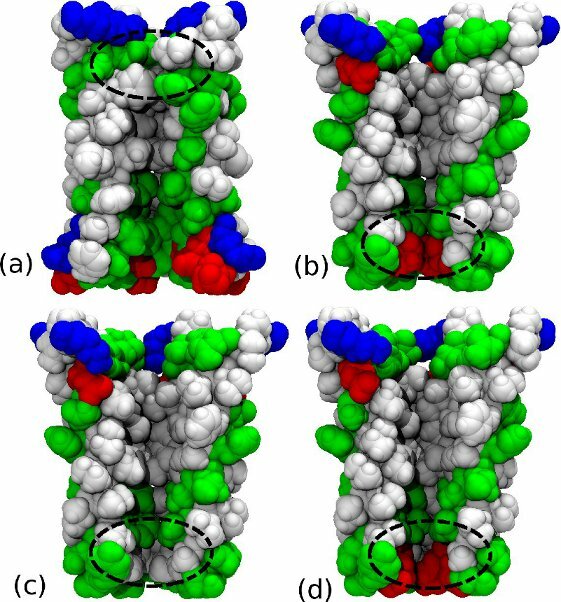 To better understand the molecular mechanisms of guest diffusion, we have studied transport in two simple crystals known as clathrates using molecular dynamics simulations, highlighting the steps involved in transport and the importance of pore flexibility in allowing diffusion to take place. Mechanosensitive ion channels allow cells to respond to mechanical forces during processes such as touch, hearing, pain and osmoregulation. The mechanosensitive channel of large conductance (MscL) from bacteria has become a model system in which to understand the principles of mechanosensation. By combining data from experiments with computer simulation we have been able to model the open structure of the channel and report on previously unobserved structural changes that might present a new mechanism of sensing tension. The methods developed for combining low resolution experimental data with simulation may be useful in understanding the structure and function of other membrane proteins. The number of times that human cells can divide is limited by the fact that the DNA is shortened during the process of replication. However, many cancer cells avoid this fate by upregulating the expression of telomerase, an enzyme that enables the extension of DNA. Small molucules that stabilise 4-stranded DNA structures known as quadruplexes at the end of DNA strands can impede the function of telomerase and so provide enticing drug targets. Recent simulations and experimental data has shown how a range of compounds can bind to and stabilise quadruplex DNA. But before such compounds can bind and lock the quadruplex together, they have to be able to reach the most suitable binding site, and our simulations indicate how bulky sibstituents can prevent this from occurring. 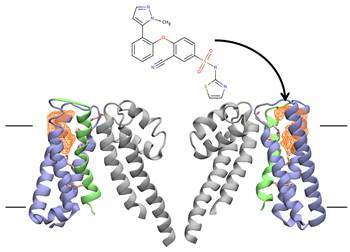 We hope that a better knowledge of the steps involved in binding and the factors contributing to the binding affinity of each compound will help in the development of this new class of anti-cancer compounds. The rapid and selective transport of Na+ through sodium selective ion channels is essential for initiating electrical signalling in living organisms. The influx of Na+ into the cell is responsible for the initiation of nerve impulses, and malfunction is associated with epilepsy, migraine and cardiac arrhythmia. 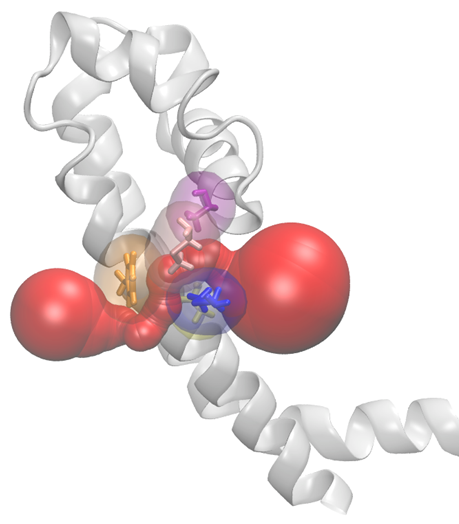 How ions pass through the pores and how the channel differentiates between Na+ and other ion types has not been well understood, largely due to the lack information about the 3-dimensional structure of these proteins. 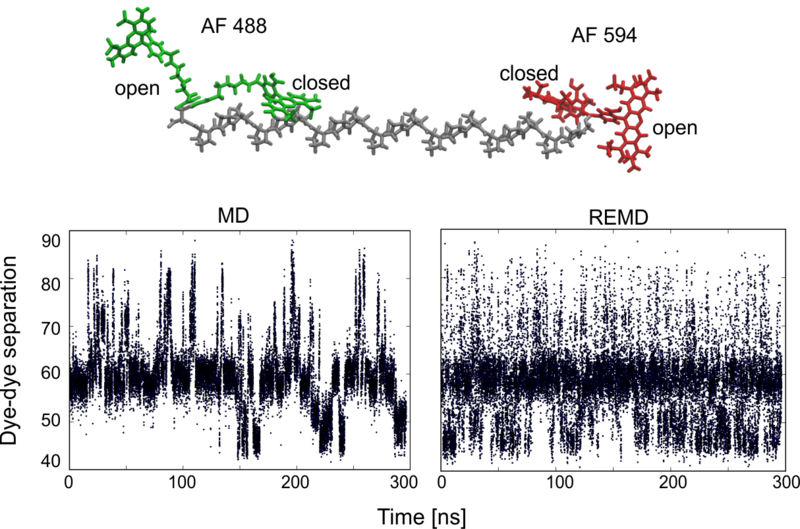 Using a recently published crystal structure of a bacterial sodium channel as a starting point (Payendeh et al, Nature 2011), we have been able to use simulations to show how Na+ pass through the pore in single file. More intriguingly, we are also able to suggest how the pore can discriminate between Na+ and K+. While Na+ can move through the pore with a near complete and ideally arranged shell of water, K+ is unable to fit with the preferred solvation geometry that involves water molecules bridging between the ion and carboxylate groups in the pore lining. Networks of hydrogen bonds are found in many biological molecules and crystalline materials, where they often have important structural roles such as in maintaining the structure of α-helices in proteins and stitching together the double helix of DNA. In rings and chains of hydrogen bonds formed from hydroxyl groups, it is possible for all the individual bonds to reorientate such that the entire network reverses direction, something that may be important for allowing conformation changes and proton transfer. Our recent simulation study has elucidated the mechanism by which such rearrangements take place by studying six membered hydrogen bonded rings in clathrates of Dianin’s compound (J. Am. Chem. Soc. 2011, 133, 18880–8). Rather than taking place in a concerted fashion, reorientation takes place one hydrogen bond at a time, creating a sequential cascade thatpropagates with increasing speed around the ring. Intriguingly, the process can be facilitated by the presence of a protic guest (in this case ethanol) that can hydrogen bond to each reorienting hydroxyl and chaperone it to the new position like a zipper moving along the chain. 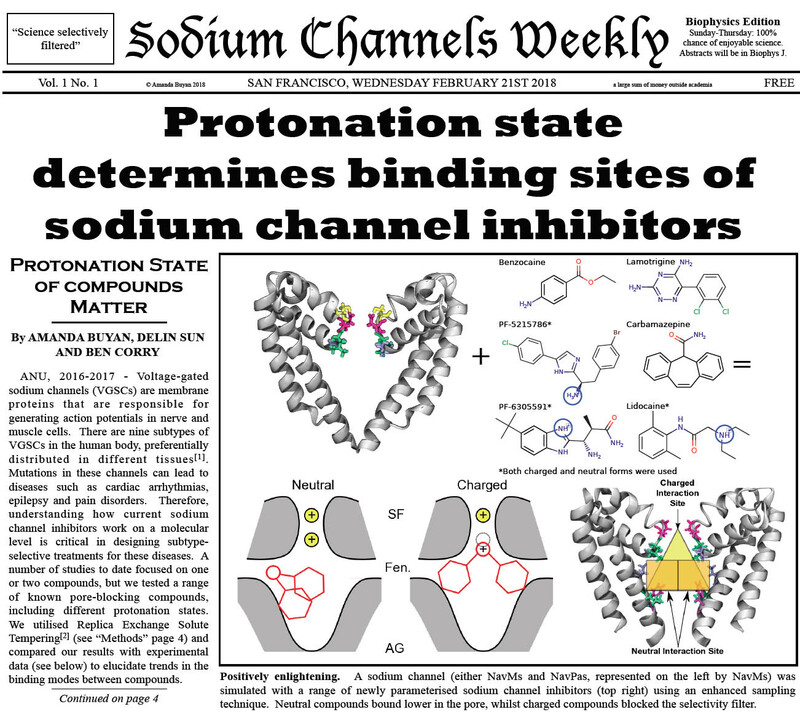 Ligand gated ion channels: Open or Closed? Most ion channels open and close at different times so that electrical signals are only sent at appropriate times in response to specific stimuli. 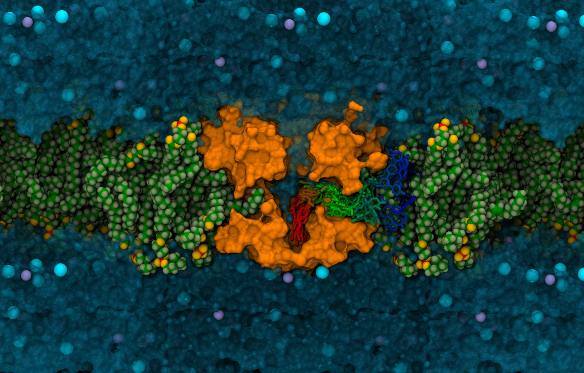 Once we have the 3D structure of an ion channel protein, you might think that it is a simple process to decide if it represents the channel in an open or closed state based upon whether a continuous pore extends through the protein. However, recent studies have shown that some channels can still block the conduction of ions even when a continuous pore exists through a process known as ‘hydrophobic gating’. 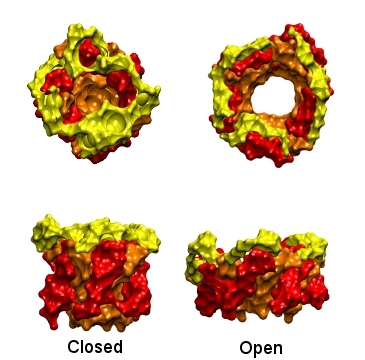 An important question following the recent publication of atomic resolution structures of four ligand gated channels from bacteria is whether each of these represents open or closed states, or perhaps some intermediate. By using simulations to determine the current of ions likely to pass through each structure and comparing this to experimental measurements, we have been able to show that ‘ELIC’ is non-conductive, ‘GLIC2’ likely represents an open state channel, while ‘GLIC1’ and ‘GLIC1M’ are only partly open, with a lower conductance than the fully open state. Many biological molecules must be able to differentiate between ion types in order to function as is the case for many macrocycles, enzymes, ion channels and transporters. The physical mechanisms by which this differentiation occurs, however, is still not well understood. In a recent paper we examine how a number of common mechanisms are used by a range of different molecules to do this. 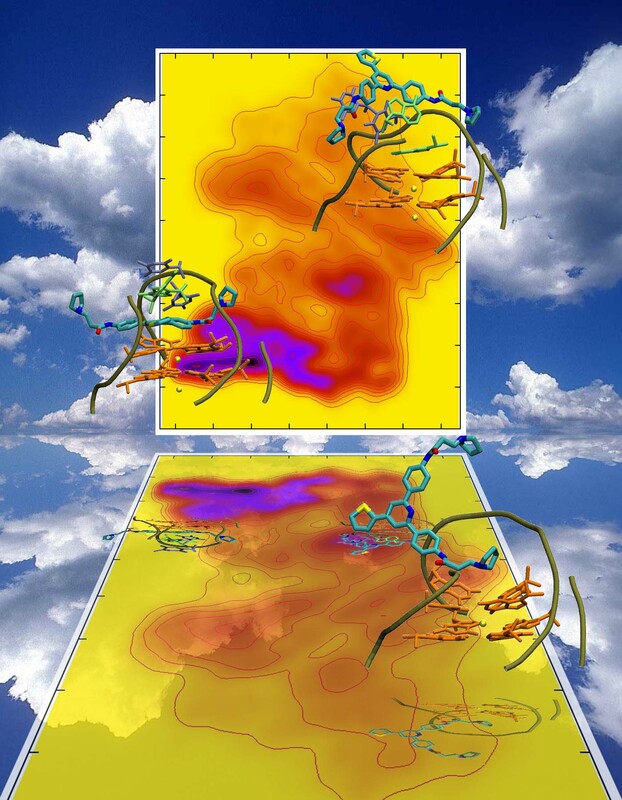 Using molecular dynamics simulations on both detailed systems and simple models, we quantify the importance of several factors which affect the ion selectivity of such molecules, including the number of coordinating ligands, their dipole moment, and their vibrational motion. The information resulting from our simulations is distilled into a series of selectivity maps that can be used to quantify the similarities and differences between the mechanisms employed by each of the molecules studied. In the future, our maps could aid in the determination of the local structure from binding energies and assist in the design of novel ion selective molecules. Many parts of the world, including most of Australia’s major cities are facing water shortages due to both an increasing population and shifts in the climate. Desalination of sea water via reverse osmosis is an attractive means of obtaining potable water, but one of its main drawbacks is the energy and cost required to force the water through semipermeable membranes that block the passage of the salt. The energy costs could be reduced, however, if new membranes could be developed with continuous pores that offer less resistance to water. Many narrow biological pores do just this: a pore of a given radius surrounded by non-polar atoms can allow for water to pass, but impede the passage of ions. 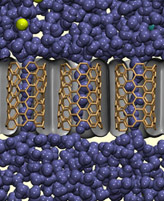 Research in the group has shown that membranes formed from synthetic pores that mimic these biological channels, such as carbon nanotubes, can be used in desalination. Not only has this work shown the exact dimensions of the pores that are required, but also that such membranes could significantly reduce the energy cost of reverse osmosis. The mechanisms of gating and ion selectivity in membrane channels have been the focus of numerous recent investigations. Previous studies showed that non polar pores could block channel currents even when not physically occluded pores due to the desolvation energy required for ions to pass through, a phenomenon known as ‘hydrophobic gating’. Similarly, charges in the protein are known to assist in the discrimination between ions, which may be called 'electrostatic selectivity'. In addition to this, our recent molecular dynamics simulations indicate that the hydrophobic effect can also play a role in differentiating between different types of ions as each ion encounters a different desolvation energy to enter a hydrophobic pore, an effect that is dependent on the radius of the channel. Furthermore, electrostatic interactions can also contribute to gating since widening of the pore can dramatically reduce the electrostatic interaction between the ion and the charged rings on the channel. We call these effects 'hydrophobic selectivity' and 'electrostatic gating' respectively. 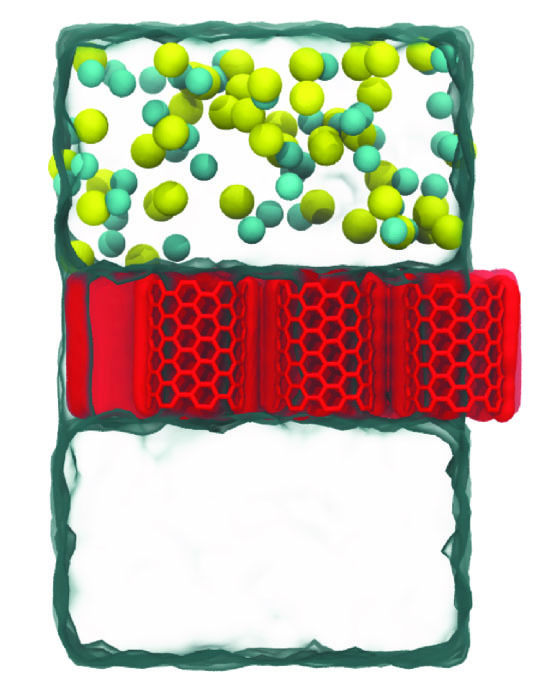 Intrinsic ion selectivity of hydrophobic pores, J. Phys. Chem. B 113: 7642, 2009. 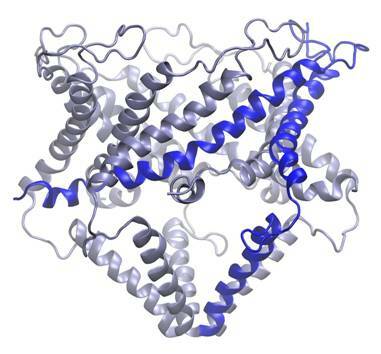 Computational study of the transmembrane domain of the acetylcholine receptor, Eur. Biophys. J. 38: 961-970, 2009. Fluorescent tags are often used as a tool for probing macromolecules like proteins and DNA. Not only can these tags be used to find the location of host molecules in a cell, they can also be used to determine the translational and rotational mobility of the host and the proximity of two molecules. Such measurements are often hampered as they require information about the specific orientation of the fluorophores, a property that is difficult to measure. To help alleviate this difficulty, we have developed a practical scheme for determining information about the orientation of fluorescent molecules directly from confocal microscope images.